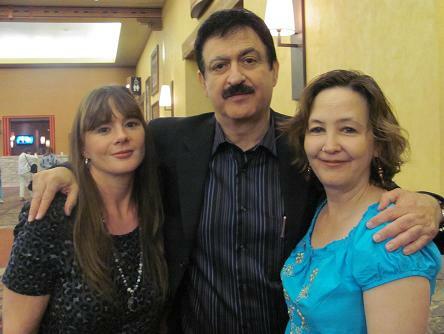 A few weeks ago, my friend Jillian told me that George Noory was coming to town. At first I was going to skip it, but then I thought it would be pretty fun if I went with Jillian. It was at the Sandia Resort and Casino and we could have some drinks and hang out because she lives up in Los Alamos so I don't see her very often. I also told my friend Sallee about it and she thought it would be fun too. The event had been billed as a "Meet and Greet." So I thought it was just people waiting in line to meet George, get books signed and have their photo taken with him. It wasn't just that though. George gave a long presentation and took questions, which we mostly gabbed through. Well, nothing against George, but I have heard his story about dental school and how he became a radio host and most of his other stories before. There was free food though and also a bar! Luckily the bar wasn't free or I might not have made it home. Still, I guess we were gabbing, laughing and having too much fun because the lady at the table in front of us actually shushed me. I haven't had anyone shush me since I was a child. Whoops! At one point George told a story about some man shoving a steak down his wife's throat and killing her. We had no idea what that had to do with anything (because we weren't paying close attention), that is why it was hilarious because we didn't know what the point was and it seemed kind of random and really weird. It was hard to hold back the giggles and much to the dismay of the lady at the table in front of us, we couldn't. So after the presentation was over everyone waited in line to meet George. He was very nice. I told him that we write for the same magazine and he said "Oh, you know Bill and Nancy Birnes!" Then he asked my name and I told him and he said something like "You are her!" That was a little scary because I hadn't expected him to know me at all. I do remember writing some not so nice things about George and c2c, right here at BoA. I actually felt a little bad about it and hoped he only knew me from UFO Magazine because I feel kind of differently about the show now. It is just entertainment and I used to take it too seriously. Then Tom Danheiser took photos of us with George and George said "I have a harem!" So I told him that I was going to publish those photos on facebook and call the album "George's Harem." He laughed. I did keep my promise. I had seen Robin Falkov earlier and asked George if Richard Hoagland was there. He said Hoagland was in the bar. So we headed off on our quest to find Hoagie. We spend like 30 minutes searching (it is a large casino) every bar and restaurant. Sometimes I would call "Hogie! Hoagie! Where are you?" That got me some strange looks. We finally got to the last bar on the 9th floor, still no Hoagie, but an awesome view of the Sandia mountains so we sat down and had more drinks and chicken nachos. Apparently George didn't know that Hoagie was not feeling well and had gone home early. That was the disappointment of the night, but other than that we had a great time! 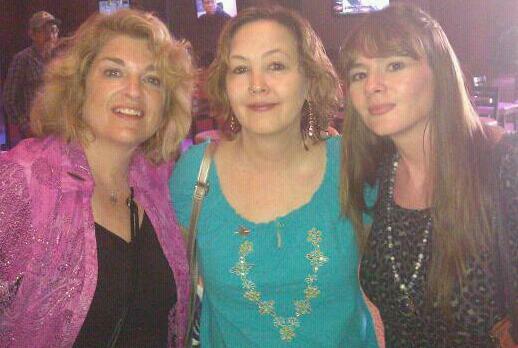 If KKOB has another George event next year, George's Harem is likely to be there again!